Hi Just got back from your lovely villa it was like home from home everything you could possibly want.The pool is one of the cleanest I have ever had when visiting usa, will certainly be using you again hopefully when we return. Our holiday was amazing and we can’t thank you enough for allowing us to use your home whilst we were there. It was literally home from home and we made good use of the games room, heated swimming pool and laundry facilities. Our Daughters loved being able to go in the pool after a hard day of walking around the Parks. As for visiting Pluto’s Palace again in the future – we would love to if you would have us!! 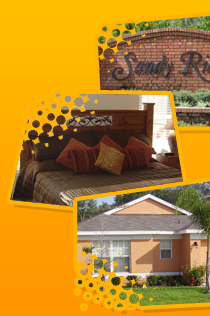 We plan to visit Florida again in 2013 and your number will be the first we look up to book our accommodation. In the meantime, if any of our friends or relatives enquire about accommodation in Florida we will certainly be recommending Pluto’s Palace! Once again, thank you and your family for such a wonderful holiday. We also put some comments in your Guest Book for other guests to read. We had a wonderful holiday and thank you very much. We couldn’t have wanted for any more from your villa, was the perfect base camp at the end of a long day shopping or at the parks It was great being a short distance away but still away from all the hustle and bustle. Great having the Publix around the corner and we liked Chillis so much we went twice! It was great having the kitchen and the fridge as we enjoyed having breakfast every morning by the pool of cereal and peanut butter and jelly on toast! The pool was a treat at the end of a long day and we only wish that we had been able to spend more time at Pluto’s Palace as it was starting to feel just like our home I would thoroughly recommend your villa to anyone I know visiting Orlando. We bought a brand new cool box/bag which did us very well filled with ice in the car and we have left it in your cupboard in the kitchen, I’m sure your guests will use it too. We wish to thank you all so much for the most wonderful accommodation at ‘Pluto’s Palace.’ The villa was spotless and beautifully-presented. The swimming pool was perfect for a pre-excursion swim of a morning, or for a post-excursion wind down of an early evening, or indeed for just hanging out and relaxing. We had every thing we needed and found the location to be absolutely ideal.The management team for the villa were helpful and very pleasant. Also, of most use, were all of the little tips and information (directions, car hire info, Disneyland ticket agent..) sent to us by yourselves. We definitely would love to stay at ‘Pluto’s Palace’ again! -Best Wishes Nicky, Des, Charlotte and Jeremy. We had a wonderful time staying at Pluto’s Palace and will definitely be returning on our next vacation to Florida. The house was beautiful and it was so nice to be able to sit on the patio and watch the kids enjoy the pool. My sons would have stayed in the pool all week if we let them. We really had a great time!!! We will definitely recommend this place to our friends and family. We even took pictures to convince them. We loved our stay in Plutos Palace – it is a lovely spacious villa in a very convenient location for the parks and just enjoying the Florida sunshine! The pool is brilliant, much bigger than we expected and the place feels like home. Thank you – really hope to return again one day! We had an absolute wonderful time at your villa & Disney! The girls were taken back by everything we experienced the home/airhockey/pool/convertible/Disney/characters they meet. They girls wore birthday shirts and Disney birthday buttons so they definitely got the royal treatment. (And loved it). We could not of had a better time everything was perfect, including the weather. had done such a thorough job checking the home over…oh well. We had a superb time at Pluto’s Palace, in fact probably the most relaxing and comfortable holiday we have ever had. The villa is superbly appointed and maintained to a very high standard. I would have no trouble whatsoever in recommending it to any of my friends and colleagues let alone somebody I do not know. As you know we always go to Florida and have done for many years. We have stayed at lots of different locations and so I feel reasonably qualified to make a judgement – in summary, this was the best.Rest assured that I will be booking it next year even if I have to go to some lengths to rearrange holiday dates to fit in with your vacancies.